On the verge of iPhone X pre-order date, DearMob free iPhone transfer tools - iPhone Photo Manager and iPhone Music Manager - stand ready to help iPhone X pioneer buyers swiftly transfer data from old iPhone to new iPhone X and get back to daily mobile habits easily. The first and foremost concern for iPhone X devotees may well be how to transfer data from old iPhone to new iPhone, thus craving for light and easy-to-use tools like DearMob iPhone Music Manager and DearMob iPhone Photo Manager. These two iPhone transfer mangers are totally trustworthy for their stable performance on iPhone to iPhone data migration. 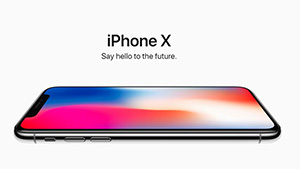 iPhone X pre-orders begin this Friday on 27th Oct. 2017 with iPhone X models available in silver and space gray in 64GB and 256GB, yet starting at a record-breaking price of $999 (US) to wow the mobile market. Though a lot of iPhone X fans are gazing at TMobile, Verizon and Sprint to bring out big promos, 57% voters on Twitter still vote for pre-ordering iPhone X rather than waiting it in stores or for contract deals. Obviously enough, compared to iPhone 8, iPhone X has stirred up a true wave of prevalence. However, for the users who already have plans on an iPhone X, it is how to blend this new iPhone X device into daily routine that matters, since it can be awfully cumbersome using an empty mobile shell without history. Jumping to a new iPhone almost means switching a digital brain - yet things could be much easier with DearMob's iPhone Music Manager and Photo Manager - which help transfer all the old memories of contacts, photos, music, bookmarks, sms, videos etc saved in the previous "brain" to the new phone. Luckily, DearMob's iPhone transfer tools are up to this iPhone data transfer cause, for free. DearMob iPhone Music Manager and iPhone Photo Manager work like charm in face of corresponding two typical storage hogs - 4K HDR photos and high-res audios. Users' precious selfies, traveling photos, DRM-free music, ringtones, and alarm songs on the over-crammed iPhone 6/7 can all be batch migrated to the newly bought iPhone X at an alarming speed of around 10M/s (photo transfer) and 18M/s (music transfer), with good quality reserved. Even when iPhone X goes storage-strapped later by 3D photography, 4K 60fps recording, and AR implementation, the free tools can help reclaim space easily and speedily. "Through our test, the two managers are approximately 3x faster and more trustworthy than other transfer software in the market," said Ricky, tech support of DearMob, Inc, "and users can DIY their own unique iPhone X ringtones however they like with the free iPhone Music Manager." DearMob iPhone Photo Manager version 1.1 for Windows and DearMob iPhone Music Manager version 1.1 for Windows and macOS are free for download at: https://www.5kplayer.com/iphone-manager/. DearMob, Inc. is a vigorous software company which develops innovative video software. In pursuing the ultimate goal of providing users with omnipotent mobile tools, it never loosens the effort to research and develop practical applications compatible with the mainstream platforms like Windows, Mac, iOS and Android. In 2016, DearMob, Inc is ready to enable dynamic growth in the fast-growing mobile software market by delivering more convenient and entertaining helper to iOS and Android users. For more information about the company, please visit: https://www.5kplayer.com.